You have fought and beat cancer, now show the world you’re a warrior by wearing this inspiring Cancer Survivor T-Shirt. Our Cancer Survivor T-Shirt is a great way to give others hope and determination to never give up the fight. 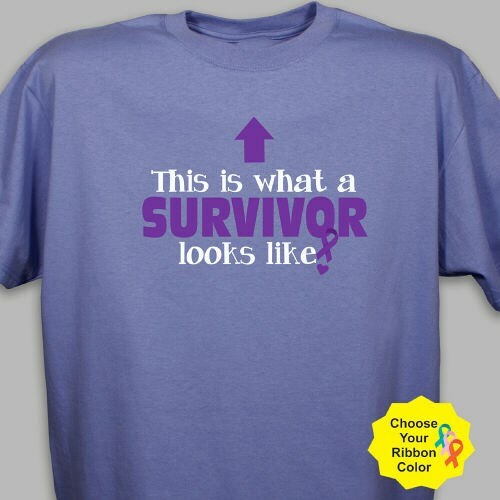 Our Cancer Survivor T-Shirt is available on 100% cotton T-Shirts, machine washable in youth sizes XS-L & adult sizes S-3XL. Personalize your T-Shirt with any Ribbon Color! Great quality and affordably priced! The T-Shirt is very good quality: nice and thick. The size is accurate. Additional Info Give those battling with cancer hope every time you wear this Cancer Survivor T-Shirt. By showing your fight, you will be encouraging others to do the same. Wear Survivor Apparel to all your awareness events, Relay Event Walks or any day you want to show you had the willpower to beat this disease. Our Cancer Survivor Key Chain & our Cancer Survivor Tote Bag also make wonderful awareness gift ideas.